To Cite: Shirazi M, Soltanmohamadi Borujeni E, Farhadifard H. Treatment of Hemifacial Microsomia: A Case Report, Iran J Ortho. 2015 ; 10(1):e4931. doi: 10.17795/ijo-4931. Introduction: Hemifacial microsomia (HFM) is a branchial arch syndrome and the second most common craniofacial birth defect after cleft lip and palate. This syndrome involves the facial skeleton and ear. The most important goal in treatment of HFM is to improve facial symmetry. Traditionally, segment repositioning and costochondral graft were used for the correction of mandibular asymmetry but recently distraction osteogenesis has been used for it. Case Presentation: In this article an 8-year-old boy with HFM is presented. 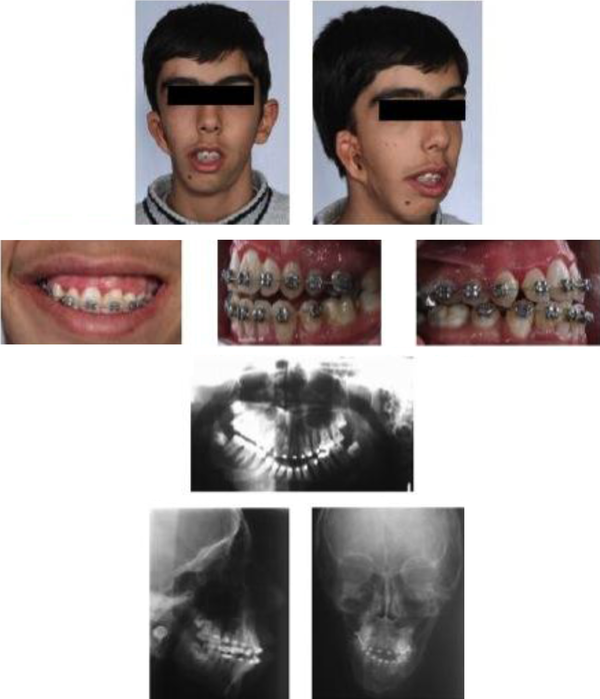 He was treated with functional appliance for one year and then at 9 years age distraction osteogenesis was performed for him and at the age of 18, maxillary impaction (right side: 3mm, left side: 13 mm), BSSO of mandible and reduction genioplasty were done for the functional and esthetic reconstruction of the face. Conclusions: Satisfactory results were obtained in the patient. 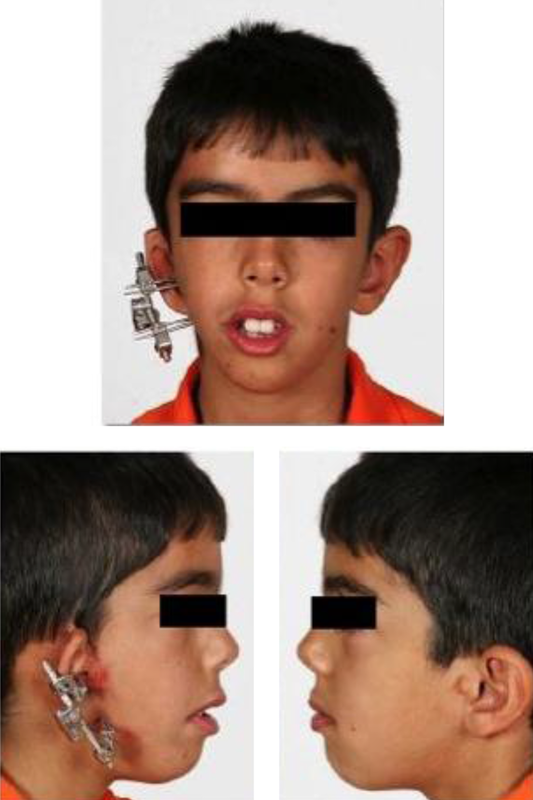 An 8-year-old boy was referred to department of orthodontics of dental faculty of Tehran university of medical sciences, Iran with the chief complaint of facial deformity and asymmetry. The patient was born to a non-consanguineously married couple at term and he was the first child of the parents and none of the family members were affected by this disease. He was conscious and cooperative. 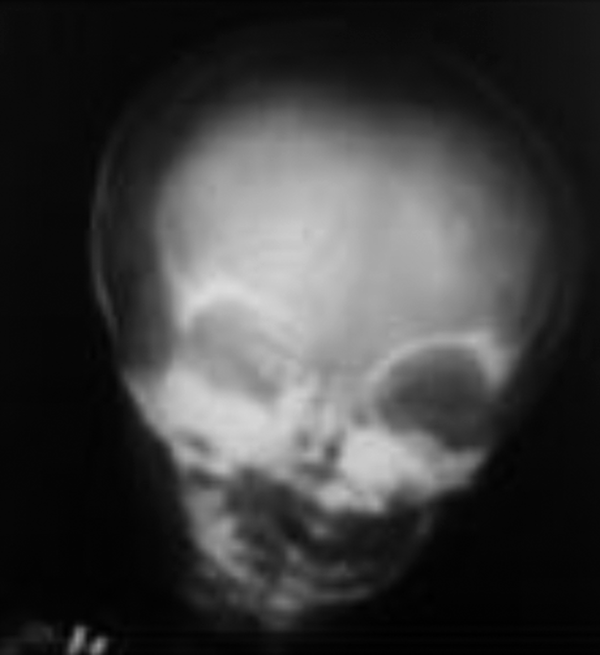 His parents were asked about the documents they had prepared before, they brought a anteroposterior skull radiograph that had been taken at 10 days of age and asymmetry of face was obvious in it (Figure 1). 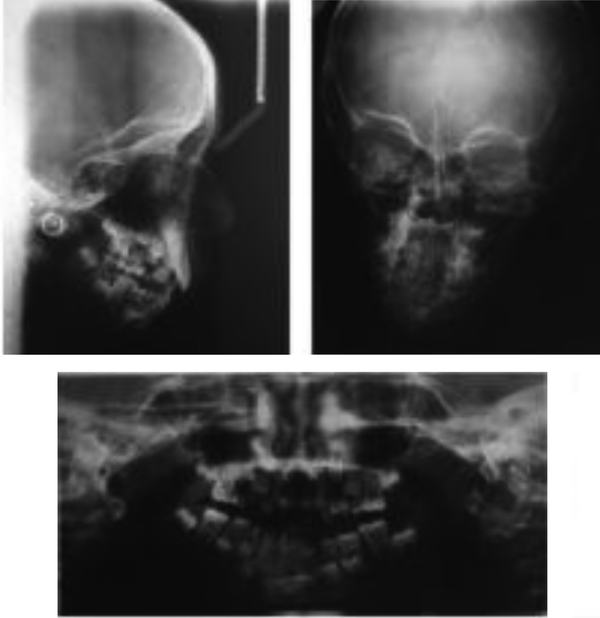 Clinical findings were as follow: malformed right ear (microtia), asymmetric face, deviation of the lower jaw towards the right side, curve of the midsagittal plane of face towards the right side, reduction of facial anteroposterior and vertical dimensions on the affected side, especially in the lower face, decreased size of the maxillary, temporal and malar bones on the right side, canting of the occlusal plan, hypoplasia of the mandibular ramus and the condyle on the right side. No abnormality was seen in left ear, eyes, nose, lips, ribs, neck movements and skin. No mental retardation was found. In radiographic examination panoramic radiograph showed hypoplastic ramus, condyle and coronoid process on the right side. Posteroanterior skull radiograph revealed deviation of maxilla and mandible towards the right side and the lack of development of ramus, coronoid process and the condyle on the right side. The Lateral cephalogram showed underdevelopment of the mandible. The height of the ramus and the mandibular length was short and the mandibular plane was steep (Figure 2). First a functional appliance was prescribed for the patient for one year. Then distraction osteogenesis was done for him and photo and radiographs were taken immediately after placement of DO appliance (Figure 3). After seven days of surgical procedure, DO was initiated at the rate of 1 mm/day. After 10 days, DO (10 mm) was completed and a two-month time was given for callus remodeling and bone formation. After the completion of DO phase photographs were prepared (Figure 4). 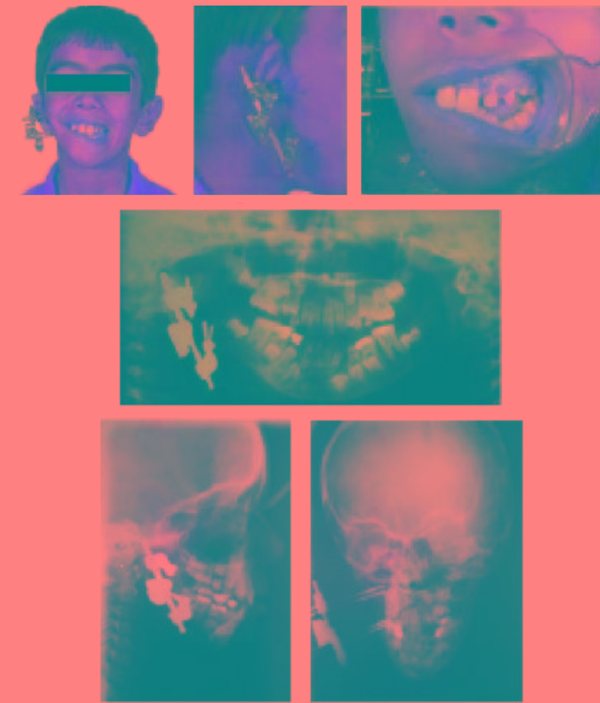 Subsequent to the DO procedure, orthodontic treatment was done for the patient until the end of pubertal growth (Figure 5). An orthognathic surgery involving maxillary impaction (right side: 3 mm, left side: 13 mm), bilateral sagital split osteotomy (BSSO) of mandible and reduction genioplasty was done for the patient at 18 years age (Figure 6). Then, post-surgical orthodontic treatment was performed for about 3 months. Thus, treatment was completed and fixed retainer was prescribed for lower arch (Figure 7). HFM is a deformity with unilateral underdevelopment of anatomical structures arising from first and second branchial arches like mandible and ear (10). The etiology is unresolved and complicated. Many researchers have experimented teratogenic and genetic components and reports indicate that several teratogenic agents, such as retinoic acid, primidone and thalidomide have caused HFM in infants born to pregnant women exposed to those agents (11). The goal in HFM treatment is to improve facial symmetry and achieving a good function and facial profile (4, 9). There are various treatment in HFM patients like TMJ reconstruction, costochondral graft, maxillary and mandibular osteotomy and DO of mandible (8, 12). DO is a procedure in which new bone is formed between the surface of bone segments that gradually are separated by incremental traction (3). Bone lengthening by osteotomy and DO was first explained by Ilizarov in 1988 (13). In 1992, McCarthey et al. elongated mandible up to 24 mm successfully (14). Marquez et al. in their case report showed that the anteroposterior elongation of mandible is relatively stable, however the vertical lengthening and soft tissue effect are minimal (15). Sakamato et al. reported that mandibular body distraction is an effective and reliable treatment for HFM (16). Latimer et al. concluded that there was a tendency for HFM patient treated with DO to return to their pre-operative asymmetry. 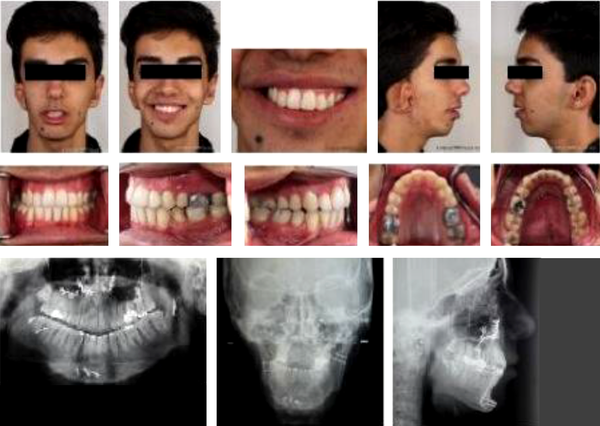 So, in severe cases they used combined traditional orthognathic surgery with unilateral DO simultaneously (10). Seo et al. treated a girl with HFM with DO at 12 years old and subsequent orthognathic surgery at 19 years old and they reported satisfactory result in a long-term follow up (9). Ossicles are derived from the first and second branchial arches, so abnormal development of the middle ear ossicles may be present in HFM. External ear abnormalities may be very mild as a flattened helical rim or severe as complete absence of the auricle; stenosis or atresia of the external auditory canal. It is common to see conductive hearing loss as a result of external and middle ear malformations in HFM patient (17). In the present study, the patient had grade II of HFM with facial asymmetry and deficiency of ramus that was treated with functional appliance and completed with DO. Surgery was the third stage of treatment plan which resulted in a good treatment outcome. In conclusion, satisfactory results were obtained in the patient. 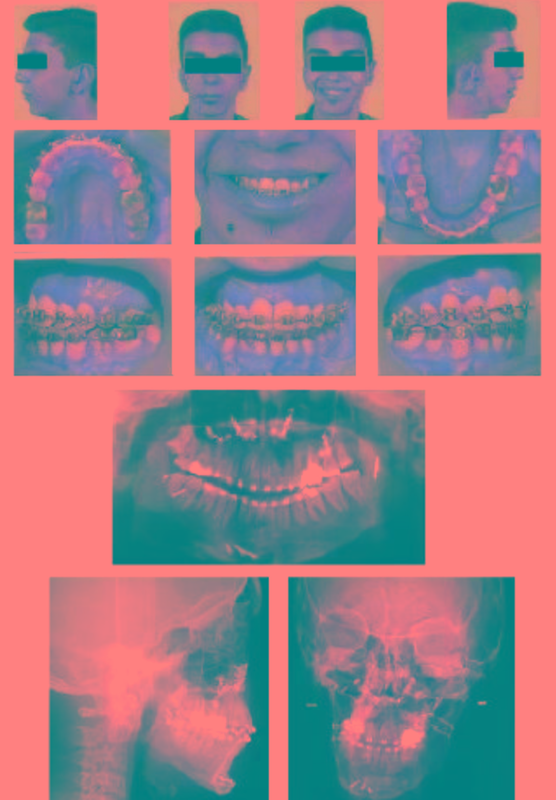 Functional appliance therapy, distraction osteogenesis of the mandibular at an early age, impaction of maxilla, BSSO and genioplasty after puberty, could be sequentially done for the functional and esthetic reconstruction of the face of HFM patient.